Another year, another trip to New York: what’s not to like? 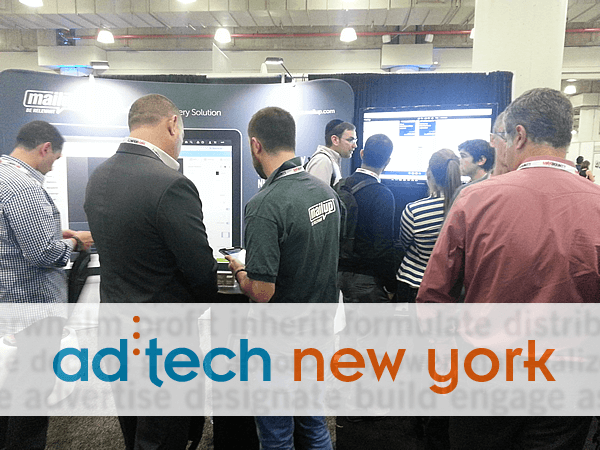 Plus, Ad:Tech is a conference where we always learn something new. And that’s on top of talking to a really large amount of marketers (i.e. we get new business and our CFO lets us come back!) and get a good feel for what’s happening. Here are some takeaways that we wanted to share with you. Learning marketing… from political campaigns! The segmentation and targeting capabilities built into Facebook, Twitter, LinkedIn, etc. truly are changing the game when it comes to precision-marketing. One of the most interesting keynotes at Ad:Tech was on the revolution that these capabilities are bringing into… politics! If you think that political campaigns are not incredibly sophisticated advertising and marketing machines, well, think again. They’re in the business of marketing their candidates by advertising their ideas, positions on issues, and statements-made-3-seconds-ago-in-a-live-debate. Not only they marketing and advertise, but they do so in a game where the stakes are so high that the pressure on finding the best tools and practices is enormous. … every consultant for every campaign working on the 2016 US presidential election has social media anything as a top priority. 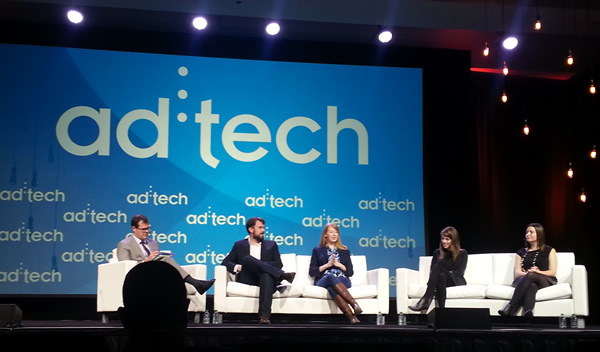 Laura Olin of Precision Strategies was one of the wizards behind Obama’s social media dominance in 2012, and was one of the guests on this really remarkable panel at ad:tech (A Winning Combination: The Intersection of Technology and Politics). It also featured executives from Facebook, Twitter, and a leading marketing agency. I go to a lot of conferences, and this was one of the most interesting discussions I’d heard in a long time. From polls to ads quasi real-time. Today like never before in history, political campaigns can react to polls within minutes, targeting the very segment indicated in the poll (e.g. “men between 30 and 40 in the Los Angeles area…”) with the very message that they believe it needs to hear in order to reinforce a winning statement or mitigate a problem (“… did not like the candidate’s statement on immigration”). Different target, different media. Different voters use different media to obtain information and make up their mind. Non-voters are also a huge target that requires different messaging, on different tools (e.g. what do the youngest voters use to get informed?). Today you can target the right message to a select audience like never before. The no-TV world. There is an increasing amount of people that never receive any news of any kind through the television. It’s the Netflix (or alike) generation: they don’t watch live TV. They never see ads on TV. They may not even have TV channels on their TV!! New habits require entirely new marketing strategies. We’ll stop here. Plenty to reflect on for businesses in any industry. It’s a really challenging time for marketers. Their customers and prospects increasingly use a crazy amount of different media and devices to obtain information, make purchasing decisions, and talk about their experience. So it comes as no surprise that advertising & marketing technology providers are more and more focused on trying to help overwhelmed marketers navigate this big mess. It’s an increasingly difficult maze of places and (typically mobile) devices that – on the one hand – is giving marketers a big headache and – on the other side – is creating great opportunities for those that learn how to take advantage of it. 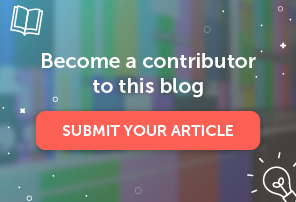 Luckily for us in the email space, it happens that the email address is often the one common denominator that works as a digital ID throughout a customer’s journey. 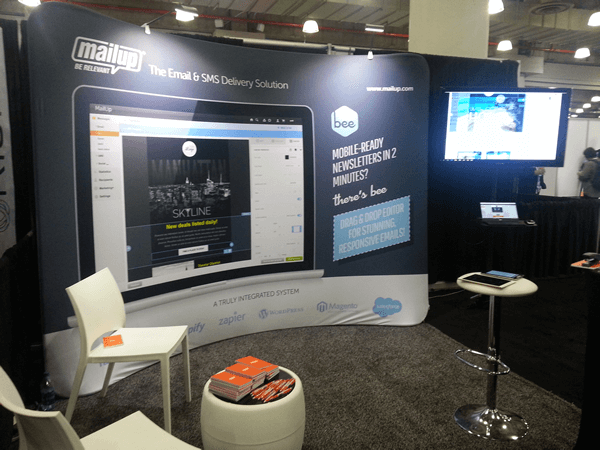 Which is one of the reasons why in an era where email should have been dead for many years, there are 2.5 billion users of email in the world and tons of marketers at our booth. OK. No one is surprised about this anymore, but the magnitude of the smartphone phenomenon is quite remarkable (apparently people use them for 3 hours a day now … my kids probably more than that!). So a lot of attention at the conference was focused on ways to ensure that communication is truly optimized for mobile devices. If mobile-ready used to be a “nice to have” just a few years ago, it is now a clear “must-have”. 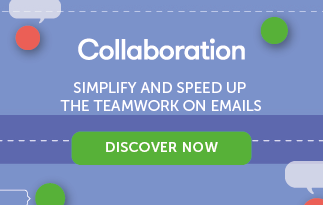 At MailUp, we were right on topic! … and talked to hundreds of companies that are constantly dealing with the issue of being able to quickly create nice messages that will render well across all sorts of devices. … but we also turned into a plugin that can be used (i.e. seamlessly embedded) in other applications that have the same need (e.g. CRM systems). A challenging time for marketers. And for us trying to build tools to make their lives easier. Challenging… but fun! See you next year in New York.